Northern Flying Squirrel is the only kind of flying squirrel on earth along with its brother species Southern Flying Squirrel. The Northern Flying Squirrels are little bigger in size than the southern Flying Squirrels. This species is known to be the only one of its kind, though there are sub-species of this found, Virginia Northern flying squirrel and Carolina Northern flying squirrel. Body: Northern flying squirrels have cinnamon or light brown colored furry skin. The mammal is greyish on the two sides of its body and the under-side is whitish. Eye: The Northern flying squirrels have, compared to their size, very big and wide opened eyes. Ears: Northern flying squirrels have roundish, tiny, and furred ears on both sides of the head. Wings: Northern flying squirrels do not exactly fly. They glide with the help of a membrane, as furry as their body, attached to the front-limbs extending to the hind ones. The membrane is called patagium. Tail: Tail of this species is furry and wide but flat. Length: An average full grown up Northern flying squirrel is 25cm to 37cm long. Weight: x.A healthy adult Northern flying squirrel weighs about 110gms to 230gms. This species of flying squirrel, Northern flying squirrel, are known to be the only of its kinds with two of its sub-species known as the Carolina Northern flying squirrel and Virginia Northern flying squirrel. It is very interesting studying the behavioral traits of this exotic mammal. The Northern flying squirrels are usually very social. In winter seasons the northern flying squirrels flock in solo-gender groups and nest. 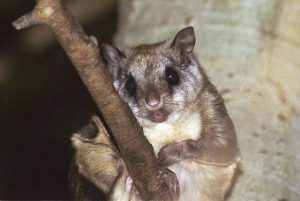 The northern flying squirrels glide up to a distance of 5mtrs. to 25mtrs. The female Northern flying squirrels glide lesser distance than the males. The Northern flying squirrels can be found in south Canada, New England, Great Lakes region, east of Tennessee, west of North Carolina, Appalachian Mountains, southern Pennsylvania, and eastern Alaska. Towards the west of US the species can be found in south of California and Utah. This exceptional species of squirrel live for about 4years. At least the wild ones do not live more than 4years. The female Northern flying squirrels are protective and territorial, unlike the males. If food and shelter is available then the males can be about 10 in numbers every hectare. In general the northern flying squirrels can be found within 0.80hectares to 31hectares. Northern flying squirrels tend to reside in moist and humid areas. However, the species have also been traced widely in areas with fir & mixed hemlocks, spruce, beech maple forest, and areas with aspen groves. These squirrels prefer nesting much higher the ground level, about 1mtr to 18mtrs high. They knit their nests in coniferous trees’ trunks with conifer needles, leaves, feathers, and furs. 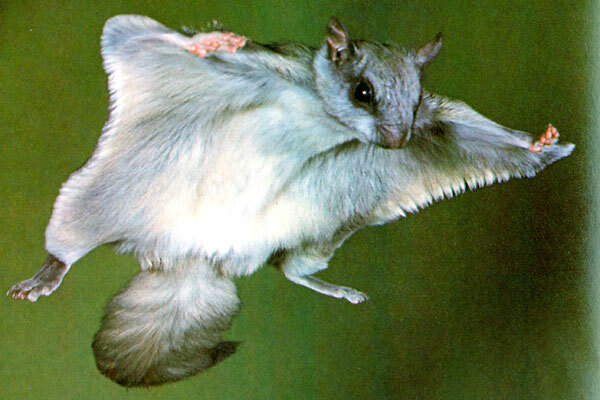 The best adapting feature of Northern flying squirrel is their gliding ability. The species are very good gliders. To top it, their four basic sense organ of sight, touch, smell, and hearing are extraordinarily active. The Northern flying squirrels are herbivorous in their diet nature. They survive on the typical squirrel diet, eating nuts, fungi, lichens, acorns, fruits, saps, buds, and sometimes birds’ eggs and small insects as well. Both male and female Northern flying squirrels reach reproductive maturity at the age of 1 year. They reproduce on the first summer since the time they were born. The female Northern flying squirrels give birth to the off-springs from March to May end. Each time while reproducing the female species give birth to about 1 to 6 off-springs. Usually the time span between conceiving and reproducing is 37 days to 42 days. The nascent born Northern flying squirrels do not weigh more than 6grams. The nascent ones are born with cylindrical tail, mingled toes, and shut ears and eyes. After six days from birth their toes separate. Their eyes and ears open up to senses after a month. The most dangerous amongst all predators of the Northern flying squirrels are the hawks, owls, weasels, martens, domestic cats, Canadian lynx, red fox and coyotes. The following points are advisable before petting a northern flying squirrel. Legality: Laws of petting northern flying squirrels are different in different states and countries. A state law permit is advisable to take before petting this exotic species. Housing: Since they are of the gliding genre, they need more vertical space than horizontal carpet area. Artificial prop root like ropes could be hung for them to play and make them feel as much as at-home possible. Nest boxes are needed to be provided in the cage for their natural habitat look. Water: The Northern flying squirrels should be provided water in a shallow dish, since they have been studied to have problems with drinking water from bottle like containers. Food: Their diet is very simple and not at all difficult to be provided with their original natural diet. Nuts, fruit seeds, fruits, small insects, sunflower seeds, corns, small worms, moths, etc. occasionally the Northern Flying squirrels can be given boiled eggs and shredded chicken to meet up their natural protein need by these supplements. 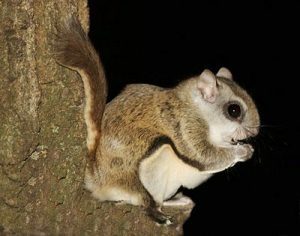 Temperament: The Northern flying squirrels have been studied to gel really well with their keepers if being bred in captivity since a very tender age. The two sub-species of Northern flying squirrels, the North Carolina Northern flying squirrel and West Virginia Northern flying squirrel are endangered by now. The main threat to these subspecies is not food, but the environmental changes. The sweeping away of forest lands makes it difficult for the species to find habitat. 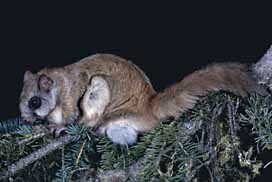 The main species of Northern flying squirrel is completely safe in terms of their existence. According to IUCN research, this species come under Least Concerned list. The US wildlife and fishery department is taking measures to ensure safety of the sub-species’ habitat problem. The measures include plans to track down the areas of convenience of the Northern flying squirrels and their habitats. Then conserving those areas with appropriate habitat for the Northern flying squirrels. Study more about the bio-environmental adaptation capacity of the Northern flying squirrel. Then try experimenting with the species under new circumstances and note their response. Crop the greenery down without bothering the species and their natural adaptation. Help to save this species, the only of its kind in the world, for future generations to see them in person, and not just read in books about them. Northern flying squirrels are very friendly creatures and interesting as well. Its sweet squirrel like nature and sharp gliding skills like bats is an amazing combination. Adopt a pair now and experience them in person, also helping to conserve the species. Though they are known as the only of its kind of Flying squirrels, they do not really fly. They glide, and they are very good gliders. The organ with the help of which they glide is not wing. It is a membrane that stretches from the fore-limbs to hind-limbs. In their nascent stage their tails are cylindrical in shape, but when they grow up their tails become furry and flattened wide. Their diet is all the same as of usual squirrels. The female Northern flying squirrels are territorial, but the male ones are not. The species live for not more than four years. They reach reproductive maturity at the age of one year. They have extraordinarily sharp and sensitive eye sight, hearing ability, and smelling power. They are extremely alien touch sensitive also. The only tendency of the species alike other flying animals are that they also tend to nest much higher above the ground level. I am writing anew book for our Weird wild and wonderful series of books for schools. I am trying to get a great picture of a flying squirrel in flight. The ones on your site are great. Do you have access to a hi res version of these photo? They would need to be about 1mb in size. It would be a great help if you coupkld help or point me to the photographer. I just wanted to let you know that… Northern and southern flying squirrels are in fact not the only flying squirrels on earth, however they are the only flying squirrels that habitate the united states. There are infact quite a few different types of flying squirrels on earth 43 known true flying squirrel species to be exact. i need to know when it’s awake and when its asleep. These mutan animals are noc turnal,they sleep in the day dummy! I woke up this past week to two cute beady eyes steering down at me from my curtain rod over my bed, it was a bit unnerving but I wasn’t sure what I had not a mouse, too big or a squirrl, too small. I called my son at work and he came and we got a have a heart trap. Some thing has been living in the walls of my other son’s room for years and I forgot since he moved away. We have been doing some construction on walls and have some holes in the walls and I assume this is how “Rocky”, got into the house. I didn’t just want to let him go since he is an endangered species and I don’t really want him back with his buddies just safe> I have contacted NH. Wildlife and Game to save him I hope. Hello! Thank you for posting this information and great ics. We had one of these in our bedroom last night! It flew from the curtain rod down to the bed that I was sitting on so I know for sure it was a fling squirrel. It seemed almost tamed and did not act freaked out at all. As if it knew us. We opened up a window and it jumped out. The thing is we live in upstate NY and I was not sure if they are supposed to be here? We had a mild winter so that might be the reason too.?. This is the first winter we had something come in and we have heard it a number of times at night earlier too. Could they have a nest in our addict. We have a went that come in to the bed room that goes through the addict. We also have a chimney and an open fire place in the bed room.. Well anyway it was a very sweet experience & I am happy it made it out without getting hurt or too afraid.. Thanks again! I am in the process of finishing a book about my life in the great out-of-doors as a wildlife biologist and have a story in the book about the Northern Flying Squirrel. I would like to use Picture #3 above in my story. Can you grant me permission or sell me the right for this one-time use? Thanks for your consideration. Larry Hayden-Wing. Do these flying squirrels live in Ohio? I have never seen one in the wild. My friend has one as a pet,but calls it a sugar-glider. They are found in around the northern parts of the state of Ohio.